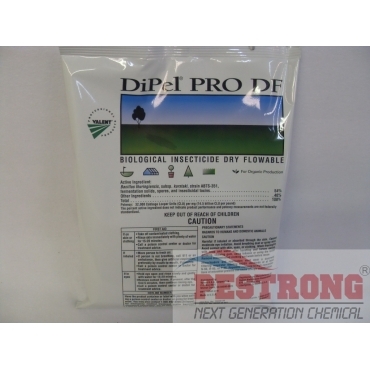 Where to Buy DiPel PRO DF, DiPel PRO DF Biological Insecticide BT Worms - Lb - $19.95 for Sale with Fast Free Shipping! DiPel PRO DF Biological Insecticide BT Worms - Lb delivers outstanding control of more than 30 species of insects, including tent caterpillar and various bagworms, looper, tobacco budworms and armyworms. Its dry flowable formulation is dust free and easy to measure and mix. DiPel PRO DF is biodegradable and has minimal effect on humans, non-target animals or the environment. It is listed by the Organic Materials Review Institute (OMRI) for use in organic production. USE ON: Turf, Tree, Ornamentals, Landscapes, Greenhouses, Vegetable crops: Broccoli, Cabbage, Cauliflower, Celery, Collards, Cucumber, Kale, Lettuce, Greens, Tomatoes, Turnips, Tobacco and Melons. This 1 Lb can cover up to 2 acres. Days to Harvest: There are no restrictions on applying DiPel PRO DF up to the time of harvest. best I have seen price and results. Better then Home Depot. Better product and more reasonable price. Great product with cheap price.